Team photo: The entire team behind the new Opel Insignia – designers, engineers and plants employees are proud of their new flagship. 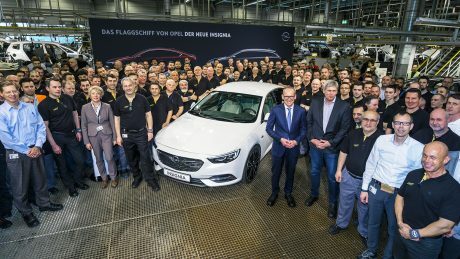 All systems go: Opel CEO Dr. Karl-Thomas Neumann, Plant Manager Michael Lewald, Deputy Chairman of the Works Council Uwe Baum (from left to right) and the Rüsselsheim team celebrate the start of regular production of the new Opel Insignia. 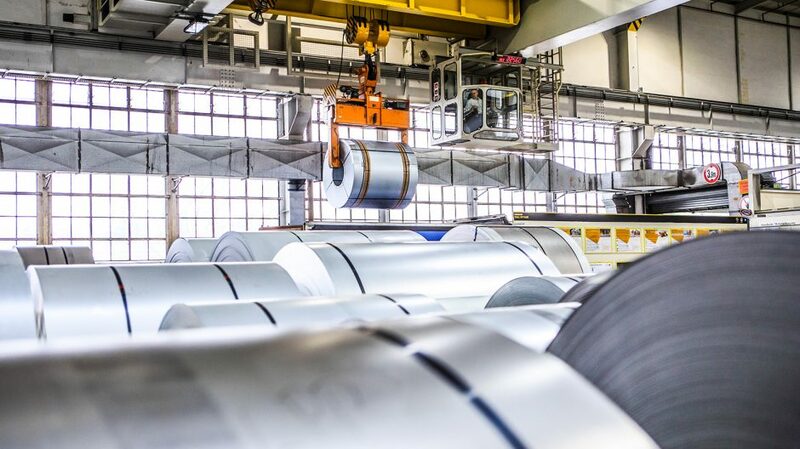 It is a long way from a steel coil to the completed car: Production at the Rüsselsheim plant begins in the press shop with steel coils that weigh up to 20 tons. New tools for the flagship: Around 100 new tool sets were required at the Rüsselsheim press shop in order to put the new Insignia into production. Thanks to state-of-the-art transfer presses at the Rüsselsheim plant tools can be changed within a few minutes. 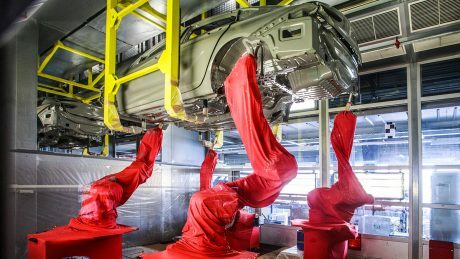 Two new production cells with an area of 13,000 square-meters have been installed in the body shop. 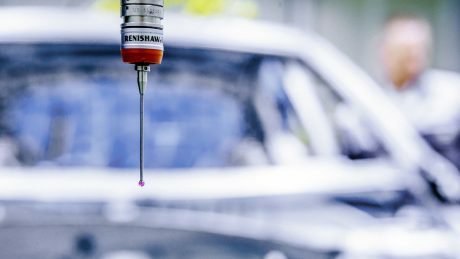 In addition to welding, adhesives are used increasingly in the body shop. This enables different kinds of material, such as steel and aluminum, to be attached to each other. 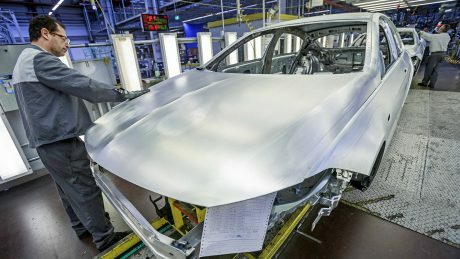 In addition to welding, adhesives are used increasingly in the body shop. The new Insignia features more than 100 meters of adhesive seams, four times more than its predecessor, which makes the new body a highly stable and lightweight structure. The hood of the new Insignia is made of aluminum and is produced at the Kaiserslautern plant. 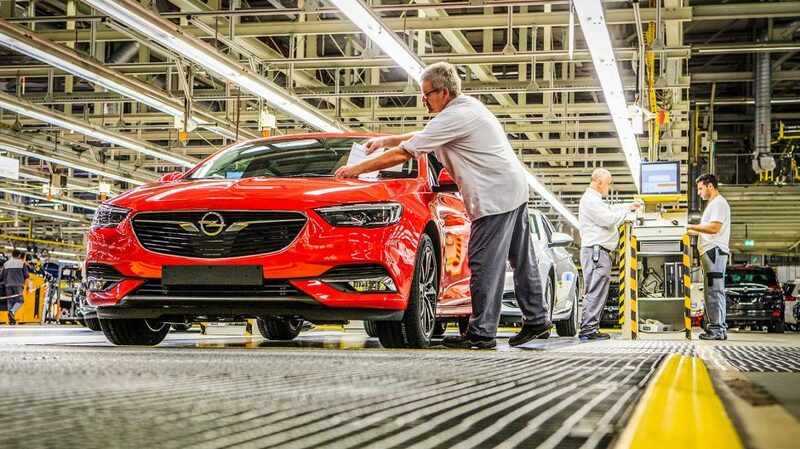 The precise assembly of each new Insignia body is carefully checked during quality control. In the paint shop, before the car receives its top coat, all the seams of the body are sealed fully automatically. High-tech machinery in the paint shop makes the body gleam in new colors. 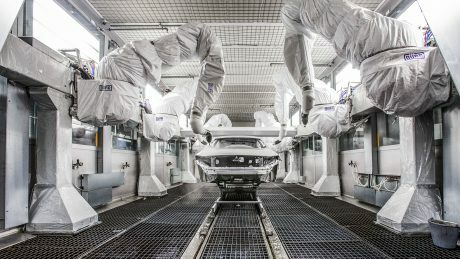 The car’s interior is completed in the final assembly shop. Each cockpit is equipped according to the individual wishes of the customer. 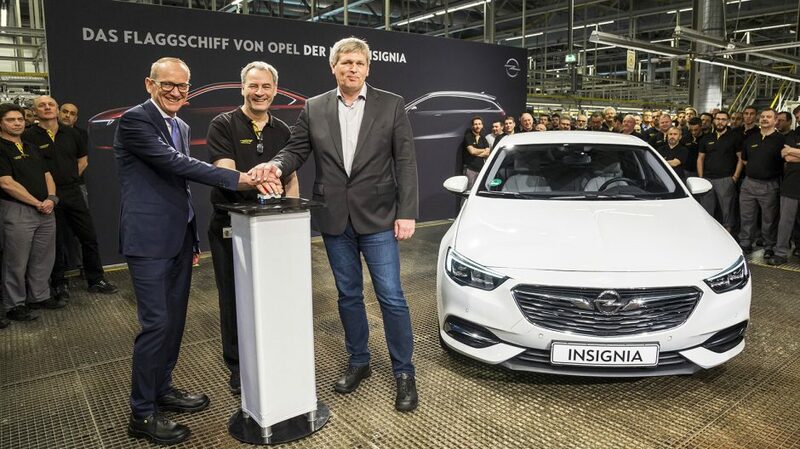 At the “wedding” in the Rüsselsheim plant, the new Insignia is married to its engine, transmission and chassis. he cars are filled with operating fluids at final assembly. At the wheel installation, every bolt is automatically tightened to a predefined torque. 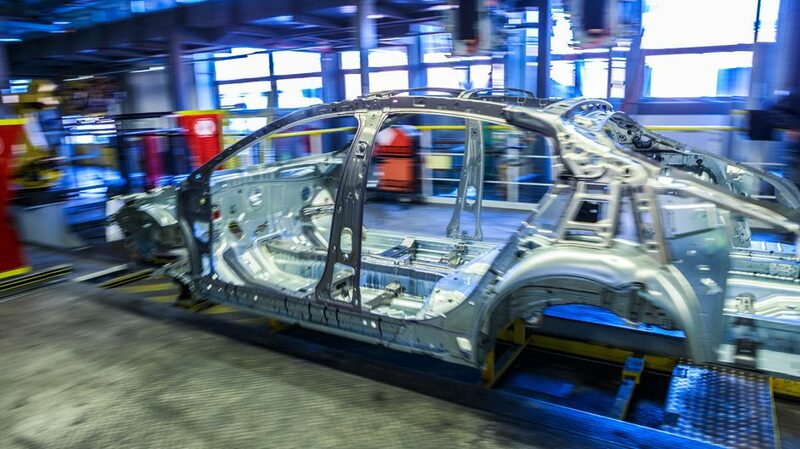 At final assembly, the body is reunited with the doors, which have been completed separately in parallel. 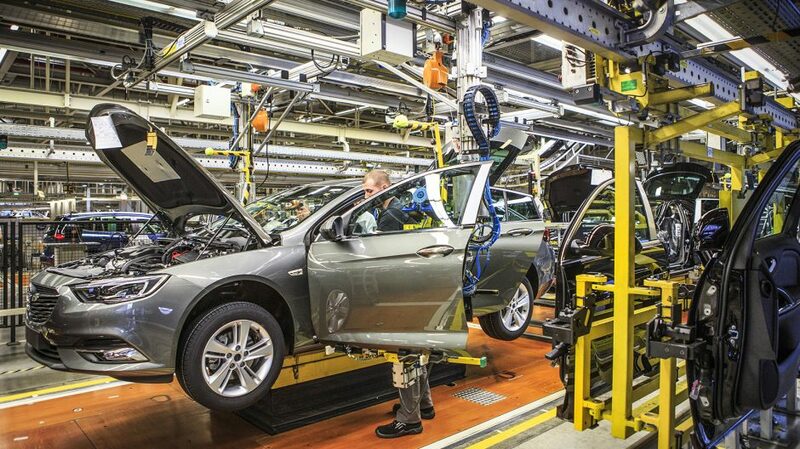 At the Rüsselsheim plant, each Insignia must pass final inspection with best marks for quality. 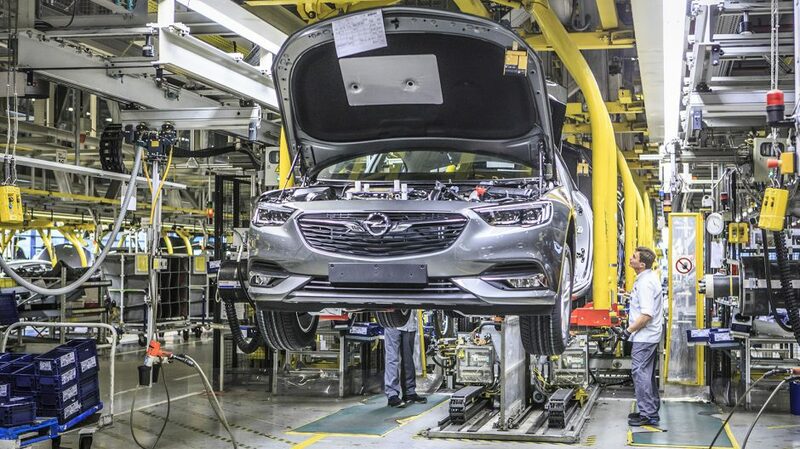 A new era has begun: The first Opel Insignia Grand Sport rolled off the assembly line on 21 March. In the run-up to this, Opel CEO Dr. Karl-Thomas Neumann had spoken with Opel Post about the importance of the new flagship, but also the planned merger with the PSA Group and the powertrain of the future. 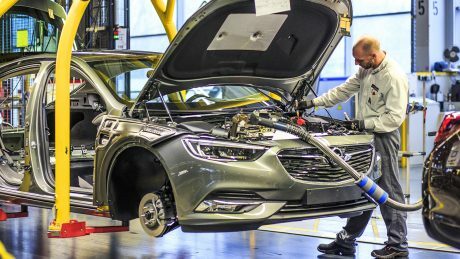 Opel Post: Dr. Neumann, today saw the start of regular production of our new flagship, the Insignia. What does it mean to you? 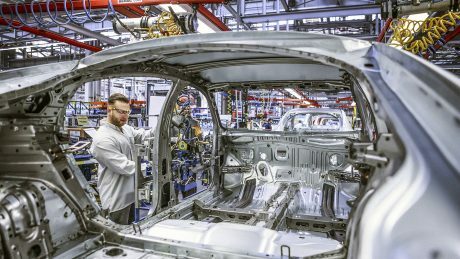 Karl-Thomas Neumann: It is a special day for Opel, Vauxhall and for Rüsselsheim. We have been looking forward to this day for a long time. Finally our new flagship has arrived. 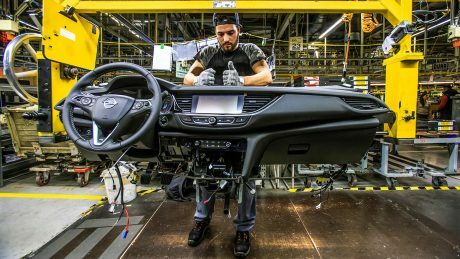 We invested more than €500 million just to prepare for the production of the new Insignia. How important is the Insignia for the company? The Insignia has regularly been one of the most purchased Opel models in recent years, just behind the bestsellers Astra, Corsa and Mokka X. Our new flagship is a core element of our product offensive, which will reach a new peak with seven new models this year alone. I am certain that the new Insignia will continue the success story begun by its predecessor. The first generation – Europe’s “Car of the Year 2009” – has been sold 940,000 times across Europe. Could you briefly take us through the highlights of the car? The new Insignia is based on an all-new architecture. 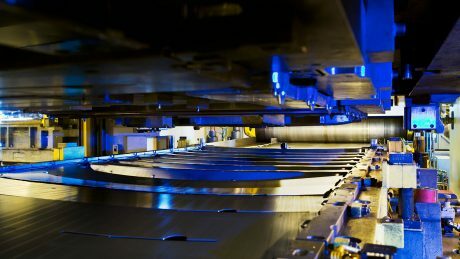 This enables weight savings of up to 200 kilograms. It is also lower but still more spacious. The car doesn’t just look extremely athletic – it is also very dynamic. Technology highlights include the new, intelligent all-wheel drive and the second generation of our adaptive LED matrix headlights. I think it is the best looking Opel for decades. 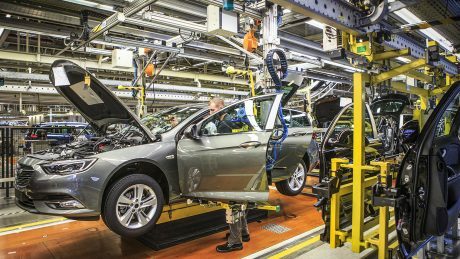 Preparing for the launch of a new car is surely no easy undertaking for the plant here in Rüsselsheim, is it? Absolutely. That is why I would like to once again take the opportunity to thank all employees in our home plant. They have done an excellent job in this strenuous period and mastered the highly complex start-up phase brilliantly. I am proud of the new Opel flagship and of the performance of the team in Rüsselsheim. And our employees are proud of the new Insignia, too. This was clearly tangible throughout the internal start of regular production ceremony held earlier today. Dr. Neumann, the last few weeks have been very eventful. 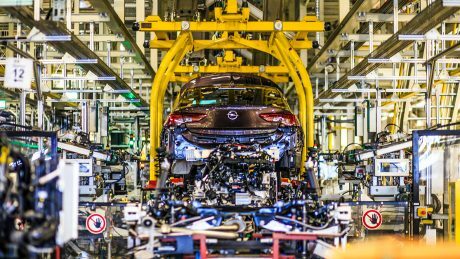 First you announced the business results for 2016, then the news on the planned sale of Opel to the PSA Group broke. How do you see the events of the last four weeks? Opel is in the middle of the biggest changes in its history. 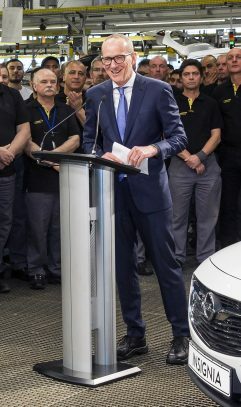 The day the contract with PSA was signed, Monday, March 6, 2017, is a historic day for Opel and Vauxhall. And it was a very emotional day for all of us, after 88 years as part of General Motors. 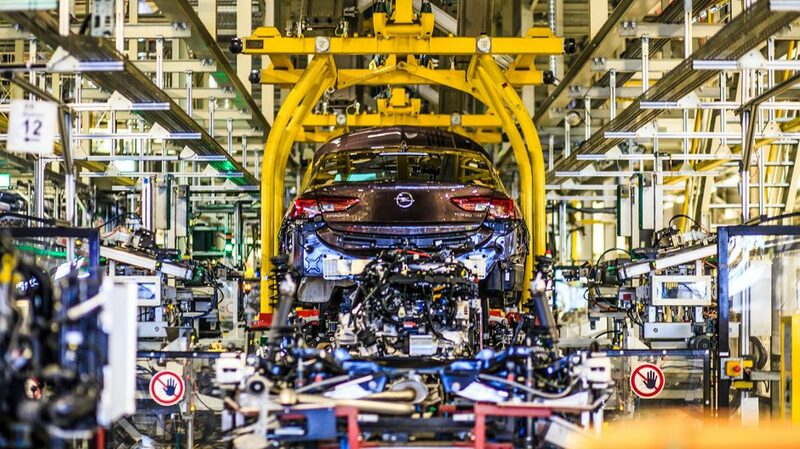 I am impressed by the way that the Opel employees have been moving forward and focusing on the advantages. Personally, I feel that it is important to stand in front of the employees and show leadership in this phase. 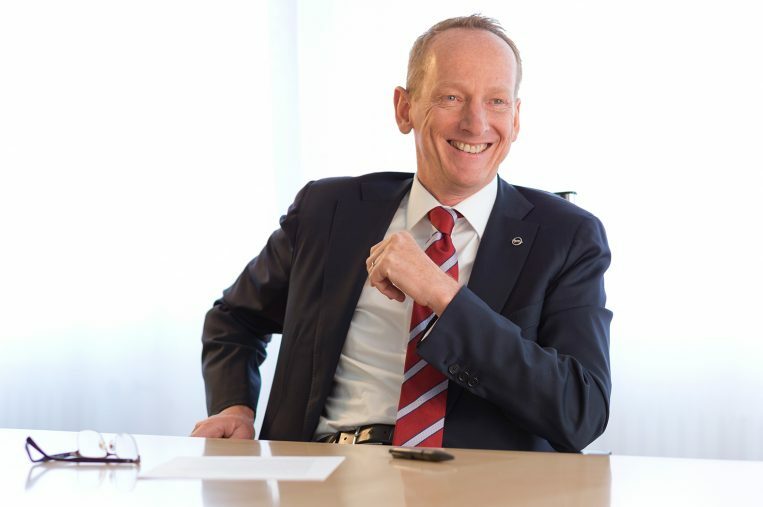 Being interviewed: Opel CEO Dr. Karl-Thomas Neumann in talks with Opel Post. You mentioned the chances that a merger with PSA would create. Could you go into a little bit more detail? If the transaction goes through as planned, a European champion with a market share of almost 17 percent would be created. This would simultaneously mean second place in Europe. All parties can benefit from the economies of scale that would be the result but they can also benefit from a joint vehicle development and the strength of two companies with highly motivated and highly qualified employees. 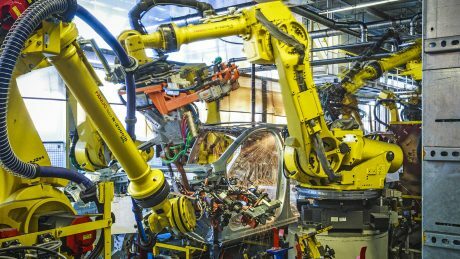 This would give the combined company the best basis to be successful in the very dynamic and challenging automotive industry. Opel has been cooperating with PSA for some years already. How has it been? We respect each other. Opel and PSA have been showing that they can successfully cooperate since 2012 already – partner-like, harmoniously and on an equal footing. Currently, the partnership has already resulted in three outstanding products perfectly suited to European taste, which will be launched successively as of early summer of this year: The new Crossland X, the Grandland X and the successor of our small van, the Combo. These models show that this teamwork results in fantastic cars – each of which maintain the respective brand characteristics. I can promise you this much: Every car from this cooperation is a real Opel. This is a very good sign for our common future. PSA is the best conceivable new partner. Together we will do everything we can to be stronger, more innovative and more successful. 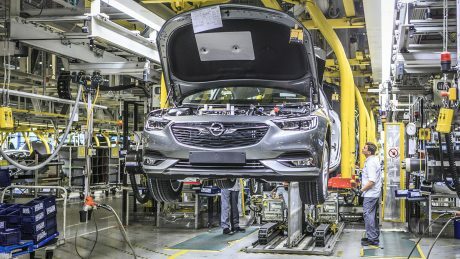 Do you think that the Opel employees are worried about their jobs? Let’s stay with the facts. We made a profit in the first six months of 2016. Then came the Brexit vote and as a result the pound collapsed. This had a negative impact of over $300 million in the second half of the year. At the end of the year, we reported a loss of $257 million. The rest is simple mathematics – we would have hit our target of generating a profit without Brexit. 2016 showed that we are on the right track. And we have achieved a lot despite adverse conditions. We improved our annual result by around $600 million, giving us the best result in ten years. 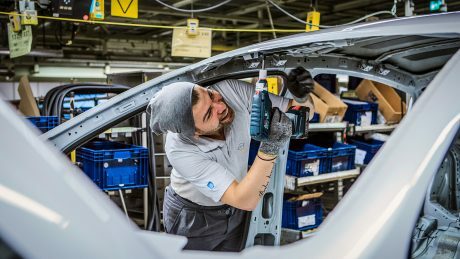 Could you once again explain the precise impact of Brexit on Opel in simple words? The Brexit decision has serious consequences for our business. The main reason is the exchanges rates of the British pound with the euro and the US dollar. They have dropped considerably since the vote last June. The United Kingdom is our biggest individual market. Customers pay for the vehicles sold there in British pounds. This means – exchanged into euro and dollar – less proceeds than before Brexit. 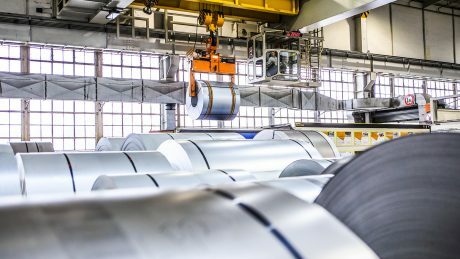 We produce in two plants in the United Kingdom, which gives us a certain “natural protection” from exchange rate fluctuations. 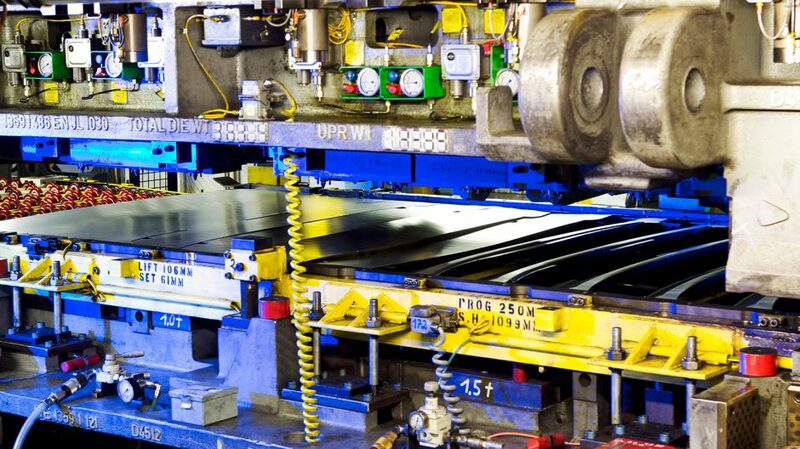 However, we mainly pay for the necessary materials required for local production in euros or dollars. Supplies have thus become much more expensive and that also has a negative impact on our result. Festive atmosphere: Opel CEO Dr. Karl-Thomas Neumann thanked the team in Rüsselsheim for the successful start of regular production. When do you want to return to profitability? We are now facing the task of creating a new plan in the context of a merger with PSA. We will only be able to agree this plan with PSA and communicate it after closing. Where does your optimism come from? First of all, there is our major model offensive. In 2017 alone, we will bring seven new models to market. This includes important volume models such as the Insignia –the Grand Sport, Sports Tourer and Country Tourer – along with the new Crossland X and Grandland X crossovers, which will represent us in the most important growth segments. Our electric car, the Ampera-e, also plays a special part. We are launching an electric car suitable for everyday use with a range of 520 kilometers (in the New European Driving Cycle) while some of our competitors are still a long way away from that. We need to take advantage of this lead. Talking about the Ampera-e: How do you see the future of electro-mobility? I am sure that the powertrain of the future will be electric. Electro-mobility will bring around more changes to the industry in the coming years than ever before. Presently, we have the most attractive electric car on the market in our Ampera-e. This car will convince customers who have never really considered buying an electric car in the past. Range anxiety and charging concerns are a thing of the past thanks to the Ampera-e. We can already see a huge amount of interest in the car. Thousands of customers have placed orders and are eager to buy an Ampera-e. Without the shadow of a doubt – the car will be a major success. Will Opel continue to sell the Ampera-e even if the deal with PSA goes through? And what about all the other planned products? Yes, we will still have access to GM’s electro-mobility technology. In general, our product planning would remain unchanged: We will introduce 29 new models by 2020, seven of them in 2017 alone. The Opel brand will continue this offensive without interruption if the planned merger with PSA goes through. Our new models are the basis for upward trends at Opel in recent years. Are the PSA and Opel brands compatible with each other? Definitely! German and French brands have always been different. When the deal is closed, PSA will get a long-established German brand, which is very different to Peugeot, Citroen and DS. Opel is and will stay German! Vauxhall is and will stay British! There is hardly any buyer switching between the brands. Customers who drive French cars are rarely customers that would drive a German brand such as Opel and vice versa. The brands are also compatible from a geographical point of view. Opel is strong in countries such as Germany and Great Britain while PSA has its strengths in France. One last question: PSA CEO Carlos Tavares has already “admitted” that he is an Opel fan and once had a Manta. How do you two get along? Carlos Tavares knows what he wants. He is a very straight-forward person with high expectations – I really like that. And he has a clear vision for the company. He knows and appreciates Opel’s history. That also speaks in his favor. I believe that we have a lot of mutual respect for each other. Therefore, I see a solid foundation for a future working relationship. The interview with Dr. Karl-Thomas Neumann was conducted by Opel Post Editor-in-Chief Roland Korioth.